Looking at the annual results of Alphabet, you could be forgiven for thinking that last year’s reorganisation of the world’s most valuable company was all for nothing. Google, which is a subsidiary of Alphabet, dominated financially. The segment, which includes most of the best-known Google products such as its search engine, maps, Gmail, YouTube and Android, made up $74.5bn of the company’s $75bn (£52bn) annual revenue. By contrast, every other subsidiary of Alphabetwas reported in the results as “other bets”, with a total income of $448m – and an overall annual loss of $3bn. But just because the projects do not bring in much money, it does not mean they have no effect on the company’s performance. If anything, it is the opposite: Alphabet is now the largest company in the world not because of the money it makes today, which pales in comparison to the former reigning champing Apple, but because of the money it could make tomorrow, the day after, or in 50 years. Buried among the “other bets” are Alphabet’s secret weapons: X projects – “moonshot” investments that could change the world. The world of medicine could be changed forever if one of Google’s bets pays off.Calico, which stands for California Life Company, wants to “cure” ageing. It sounds like a fool’s errand, but it only takes a small tweak in mindset to see why some might view it as a fight worth having: ageing is the single biggest cause of death and disability in the world, and yet, unlike every single other cause, it is viewed as inevitable. A world where Calico succeeds in its goal of identifying and treating the underlying causes of ageing would represent the single greatest leap in healthcare since the discovery of antibiotics in the early 20th century. Critics point out that it would also remove one of the major factors keeping humanity from a crisis of overpopulation. But would you commit yourself to ageing and death if you could avoid it? And if not, how can you ask others to do so? Of course, one other thing would happen if Calico’s gamble pays off: Alphabet’s profits from the medical industry would make its technology business look like small change. These days, when we think of medicine, our minds turn to pills and syringes, in hospitals and doctors surgeries. But one Alphabet subsidiary, Verily, is taking a gamble that the future of medicine looks a lot like the future of tech. Taking the trend of connected medical devices such as fitness trackers and implantable blood-sugar monitors to their logical conclusion, the prototypes developed by the company are gadgets that could change people’s lives for the better. The company hit headlines in 2014 for revealing a smart contact lens, which aims to measure glucose levels in tears, permanently removing the need for invasive blood tests for diabetics. A few months later, it revealed a smart spoon: stabilised cutlery to help Parkinson’s sufferers eat. Imagine going to the doctor’s surgery and being handed a slim black wristband that monitors your vital signs and feeds back minute-by-minute data to the GP and pharmacists so they can adjust your dosage, call you back if it gets worse – and check that you’ve been doing enough exercise. Not everything Verily is building is hardware. Its other major goal is to complete the “baseline study”: an attempt to map a healthy human body, in its entirety. The project is collecting every sort of biological data possible, from genetic to anatomic, from physiological to psychological, in an attempt to build a chimeramodel of what a healthy human looks like. The short-term goal is to use the model to identify deviations far sooner than they can currently be picked up, and ultimately identify problems like cancer and heart disease when they can be prevented, rather than cured. Not every project is as wild as trying to cure death. But even the smaller ones could alter our relationship to the rest of the world. Project Loon is one example: it represents the company’s attempt to bring internet access to rural communities through a network of weather balloons, floating in the stratosphere, acting like ultra-low-cost satellites. The project is in direct competition with a similar plan from Facebook’s internet.org, which aims to use solar powered drones to fulfil the same goal. And if either project pays off, it will usher in a world of genuinely ubiquitous connectivity: there will be nowhere on Earth that is offline. So telling your boss “I was in the middle of the Amazon” just won’t cut it as an excuse. Boston Dynamics was acquired by Google in 2013. It had initially existed largely as a contractor for the US military, developing machines that can walk on rugged terrain. The BigDog quadrupedal cargo robot was the outcome: built like an ox, and walking with an unearthly whirring sound, even in its prototype form it demonstrates unnerving surefootedness. Unfortunately, they are too noisy for the US marines, which cancelled a contract with Boston Dynamics in December. But the company is also looking at non-military uses of its robots, and has committed to taking no further contracts from the US Department of Defense. So what’s the first outcome? Atlas, a 150kg, 1.8 metre tall bipedal robot – that can do the hoovering. Using a human shape is pretty inconvenient in robot design, because it turns out it is quite hard to balance on two legs, but our vanity means we keep on building them anyway. And so keep an eye on Boston Dynamics for your best hope of a Google-powered robot butler in the future. Hopefully, they will have dealt with the noise by then. All of this technology is of little use if it is driven by carbon-belching power stations that will melt the ice caps before we even sit behind the wheel of a self-driving car. So Makani, another X project, aims to create ubiquitous wind power, available wherever the air moves. Their current prototypes look like a cross between a kite and drone, sitting at the end of long cables circling in the air. Their lightweight construction means they can operate where a traditional windfarm cannot, and be put up for a fraction of the cost. Their height allows them to reach high winds more than 300 metres in the air. Last September, an ex-Google employee managed to buy Google.com for $12. This week, Google finally revealed the details of how it reclaimed the rights to its own website. It all started when the search giant accidentally put its own home page up for sale on its own web address marketplace, Google Domains. Sanmay Ved, a former Google ad sales specialist who is now an MBA student at Babson College, was perusing available website domain names late one night when he noticed Google.com was available at a price of $12 per year. Curious to see what would happen, Ved purchased it, and received confirmation that he was Google’s new webmaster, according to Ved’s LinkedIn post describing the episode. Alas, within “a minute or so,” Google canceled the transaction, apparently realizing its error. But a few days later, Ved received an email from someone at Google, offering him a consolation prize (“in a very Googley way,” Ved wrote): A check of $6,006.13, Google disclosed in a post on the company blog Thursday. The company (which recently renamed itself Alphabet) chose that amount because it “spelled-out Google, numerically (squint a little and you’ll see it! ),” according to the blog. Ved, however, refused to accept Google’s initial reward, requesting that they donate the money to a certain charity, the Art of Living Foundation‘s center in India. Naturally, Google paid the organization double the sum. That’s a total reward of $12,012.26–though it’s unclear what that spells in Google’s numerical, uh, alphabet. The case is Oracle America Inc. v. Google Inc., 10- cv-03561, U.S. District Court, Northern District of California (San Francisco). White House and congressional staffers have asked Silicon Valley executives for new talks in Washington, D.C., to resolve a standoff over encrypted communication tools in the wake of the Paris terrorist attacks, people familiar with the matter said. The approaches are among the most concrete signs of how last week’s bombings and shootings have put a new spotlight on the debate about whether American companies should be allowed to offer ultrasecure messaging tools. There is no evidence the Paris attacks have changed technology companies’ view that strong encryption protects consumers, and that providing a way for police to eavesdrop would open the door to exploitation by criminals and repressive governments. But Apple Inc., Google parent Alphabet Inc., Facebook Inc. and others face a difficult public-relations dance, because executives don’t want to be seen as brushing off the implications of a tragedy. “It’s not the ideal time to be out there touting the benefits of encryption,” said an attorney who has worked on encryption issues. There is no evidence Islamic State attackers in Paris relied on scrambled communications. Some used run-of-the-mill text messages, which can be easily monitored if a suspect is known, according to French media reports. The Paris attacks came amid an 18-month feud between Washington and Silicon Valley that began when Apple and Google released new smartphone software that the companies said they cannot unlock, even if faced with a court order. Top U.S. law-enforcement officials have said the software would cripple some criminal investigation. Talks aimed at ensuring law enforcement access to certain messaging systems and devices reached a stalemate in the fall. Unwilling to dictate product specifications to some of the nation’s most successful companies, the administration decided not to push for a change in law. The Paris attacks may complicate efforts to reach a near-term compromise. “There is a solution out there and there’s a way to get to it but this isn’t the month to be starting down that path,” said James Lewis, a cybersecurity expert and former Clinton administration official who has consulted with tech companies and government. He and the Center for Strategic and International Studies, where he is a senior fellow, had planned a forum on encryption policy this fall. After the Paris attacks, he postponed it. Since Paris, Sens. John McCain, (R, Ariz.), Dianne Feinstein, (D, Calif.) and other lawmakers have said they want to ensure investigators can access the content of encrypted communications. Mr. McCain has aid he wants to pursue legislation. Apple has said it would never build a government backdoor into its products, because doing so would create security vulnerabilities that can be exploited by criminals. On its website, Apple says encryption protects trillions of online transactions daily and eliminating it would expose people to many risks. Rachel Whetstone, former head of communications and public policy at Google, said in February that governments don’t have and should not get backdoors to access Google user data because the company has a duty to keep users’ information private. A person familiar with the company’s thinking said Google’s views on encryption haven’t changed. Even if Apple and Google could be convinced to cooperate, tech executives say there are dozens of other encrypted communication systems. Most encryption techniques are publicly known and terror organizations could build their own alternatives, they said. “The cat is already out of the bag,” added one executive. One technology executive acknowledged mixed feelings. “While I continue to feel that outlawing end-to-end encryption would be both ineffective and a slippery slope for society, I’m also aware that I have limited knowledge of all the scary things happening in the world today,” said Ted Livingston, chief executive of Kik Interactive Inc., developer of the Kik Messenger messaging application. The Waterloo, Ontario, company’s app doesn’t store the content of messages on the company’s servers. That means, the company says, it can only give authorities data on users, not transcripts of what they say to each other. It faced some negative publicity following reports in The Wall Street Journal and elsewhere that Islamic State operatives see this feature as advantageous and use the app. Google on Thursday announced a remarkable measure that could shift the balance of power between copyright claimants and those who upload YouTube videos for purposes of parody, news reporting or other examples of fair use. Google on Thursday announced a remarkable measure that could shift the balance of power between copyright holders and the people who upload YouTube videos that feature songs and images from others. The measure, described on the Google Public Policy blog, will involve YouTube GOOG picking up the legal costs of certain video creators who upload clips that appear to be lawful, but who are ordered by copyright claimants purporting to control the rights to take them down. In the past, it’s been easy for those who dislike such videos to scrub them from the internet by submitting a so-called “DMCA notice”-a legal claim that obliges websites like YouTube to take down videos posted by others. While video creators can ask for the video to be restored, the process can take weeks, and does not shield them from copyright lawsuits. Courts in such cases would likely find the videos qualified as fair use, and shield the creator from the copyright claim. But unfortunately, the litigation process is frightening and too expensive for most people-even if know they would win. The practical effect is that, since the copyright claimant holds the upper hand, the DMCA process serves as a cheap and nearly risk-free way to censor a video or other unflattering information. Google is reportedly taking a page out of Apple’s playbook and expressing interest in co-developing Android chips based on its own designs, according to a report today from The Information. Similar to how the iPhone carries a Ax chip designed by Apple but manufactured by companies like Samsung, Google wants to bring its own expertise and consistency to the Android ecosystem. To do that, it would need to convince a company like Qualcomm, which produces some of the top Android smartphone chips today using its own technology, to sacrifice some of its competitive edge. Google did not respond to a request for comment. The discussions around Google-designed chips, which The Information say occurred this fall, originated around the company’s desire to build an “enterprise connectivity device” — possibly the Pixel C laptop-tablet hybrid unveiled in September — that would rely wholly on in-house technology. 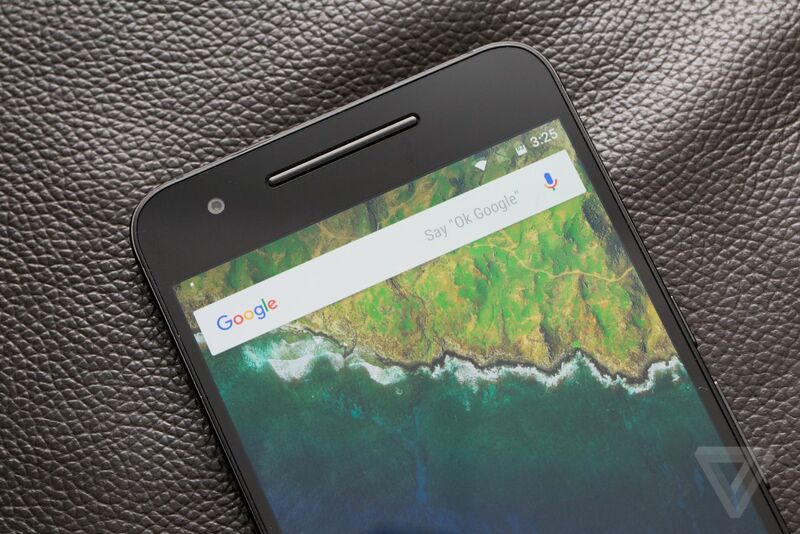 Soon, Google was discussing the possibility of designing its own smartphone chips as well, the report states. One benefit of Google’s strategy would be the ability to bake in cutting edge features into future versions of Android, like support for augmented and virtual reality, that would require more closely integrated software and hardware. However, finding a chip co-developer may prove difficult. Though Google may find a willing partner from the pool of low-cost Android manufacturers, that partner may not be able to produce the highest-quality chips capable of powering high-end smartphones. The high-end market, which Apple dominates, is where Android fragmentation may be costing Google precious sales. One possibility, if chip makers don’t agree to use Google designs, is requiring manufacturers of Google’s Nexus line use only its own designs — all the way from the chip to the body of the device. Facebook posted quarterly results that topped analysts’ expectations Wednesday, as ad revenue jumped and its user base continued to balloon. The social media giant reported third-quarter earnings of 57 cents per share on $4.5 billion in revenue. Wall Street expected the company to deliver quarterly earnings per share of 52 cents on $4.37 billion in revenue, according to consensus estimates from Thomson Reuters. Shares rose as much as 3 percent in extended trading, which would mark an all-time intraday high. 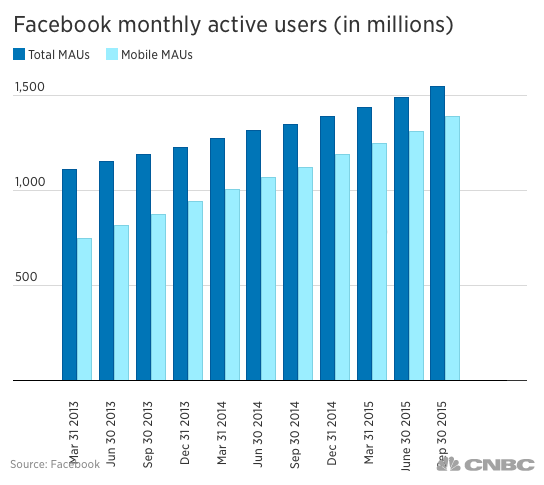 Monthly active users, or MAUs, rose 14 percent from the previous year to 1.55 billion, as of Sept. 30. Mobile MAUs came in at 1.39 billion, and both narrowly beat analysts’ expectations, according to StreetAccount. 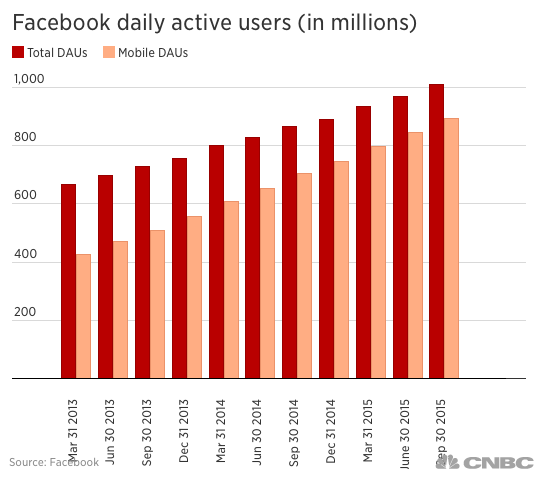 Daily active users also climbed 17 percent to 1.01 billion, beating the Street’s expectation of 992 million. Nearly 900 million mobile users were active daily. Advertising revenue — the vast majority of Facebook’s sales — jumped 45 percent from the prior year to $4.3 billion. Mobile ad sales accounted for 78 percent of that, up from 66 percent in the prior year. 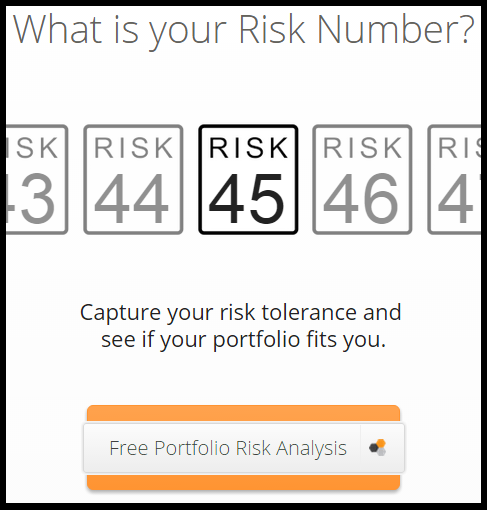 “We think we have the best mobile ad product in the market. We’re able to target, we’re able to measure. We have broad scale,” Sheryl Sandberg, chief operating officer at Facebook, told CNBC. In a conference call Wednesday, she pointed to advertising traction on photo sharing app Instagram, which topped 400 million MAUs this year. Facebook is “really pleased with the marketer demand for Instagram ads,” Sandberg said. On the call, CEO Mark Zuckerberg highlighted progress in the company’s video segment. He noted the platform now has about 8 billion daily video views. Facebook is inching closer to a $300 billion valuation, only three and a half years since it went public. Its stock had languished below the IPO price of $38 per share for more than a year but has since rallied. Shares of Facebook have surged nearly 38 percent in the last 12 months. “At this multiple, they’re going to have to continue to put up above 32 to 33 percent year over year revenue growth. I think if they continue to do that, the EPS numbers basically don’t matter for the foreseeable future,” Leigh Drogen, CEO of financial estimates platform Estimize, told CNBC. Last quarter, the social networking giant said it would increase investments in areas such as Messenger, WhatsApp and Oculus to boost advertising revenue from mobile and drive future growth. Total non-GAAP expenses rose 51 percent to $2.09 billion in the third quarter. Earlier this week, Facebook said it was testing an artificial intelligence (AI) feature that will allow it to answer questions about a photo, a feature aimed at helping blind people “see” images uploaded to the social network. The company has been pushing hard to develop its AI capabilities—alongside Apple (AAPL) and Google (GOOGL)—with the technology being seen as key for the future of these companies. Earlier this year, Facebook unveiled a technology called “Memory Networks” which allows a machine to perform sophisticated questioning and answering.